My vacation was good. You guys, it was goooooooood. I travel a lot for work plus some for pageants, so sometimes I forget that I even need actual vacations. Then I get on one and my whole being feels different. I don't just unwind, I literally decompress. My spine starts to feel as if it's a part of my body rather than an ancient torture device conceived by my office chair and a cranky customer and stored in the depths of the Tower of London. Inevitably, I ease up on my ordinarily strenuous grooming routine, and my lovely friends and family almost never run away shrieking and gesticulating through the village at the site of my hideous countenance. 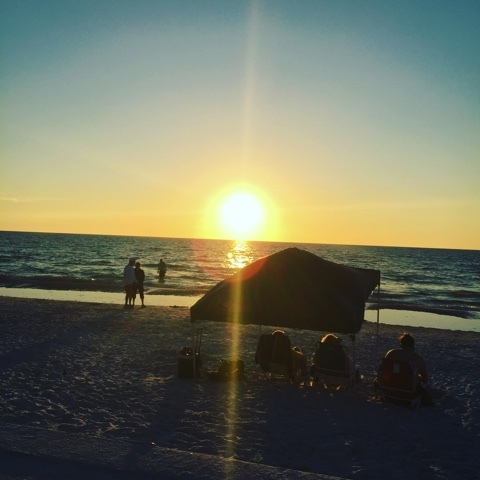 We just returned from an entire, sun-soaked, blissful week in St. Pete Beach/Treasure Island, Florida. While many of the seemingly hundreds of restaurants crowding Gulf Blvd on this stretch of coastline are tourist traps, there are gems awaiting your appetite among the garish beach bars and chain seafood emporiums. I've got a few ready for your vacation planning needs. My culinary find for you in Treasure Island is The Floridian, a Cuban sandwich shop that's popular with locals more so than tourists. You can find it just a couple blocks from the Bilmar, towards St. Petersburg on 107th Ave. It's been around since I was wearing flowered Gap baby-doll dresses and Doc Martens in high school, and it has a killer Cuban sandwich. 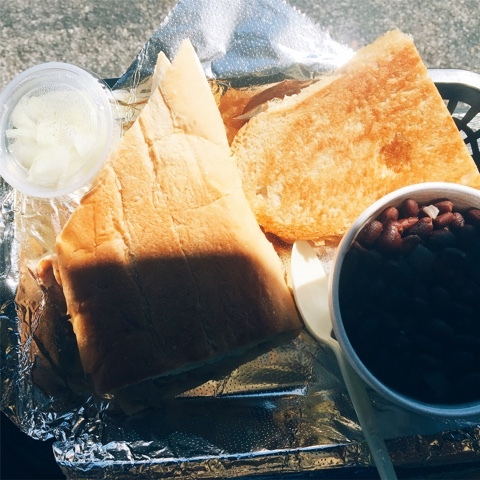 For less than $7 a piece, we each got half a sandwich, Cuban toast, and yellow rice with black beans. Everything was balanced, crispy, savory and fabulous. Most Cubans have so much Swiss cheese, mustard, and dill pickles that the meat gets overpowered. In both Shawn's Cuban and my puerco sandwich, the tender, juicy pig was the star and the other ingredients were in complete balance. The yellow rice and black beans were aces, savory, well-seasoned, and completely soul-soothing. Look at all that food! This joint was jumping at lunchtime on a weekday, and for good reason. Make it your Cuban hook-up if you don't want to leave the beach to go into Tampa. 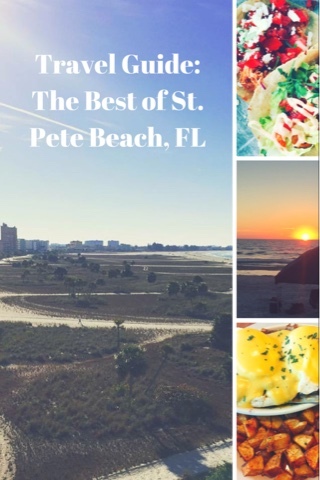 The bulk of places to stay in the area are concentrated in St. Pete Beach, and so the dining options are plentiful as well. From our casual observations, we would stay at either the Tradewinds or Sirata resorts if we came back and wished to stay in SPB. With so much vacation goodness crammed into so few square miles, you'll probably need a hearty breakfast to build a base for your day of sun and sand. 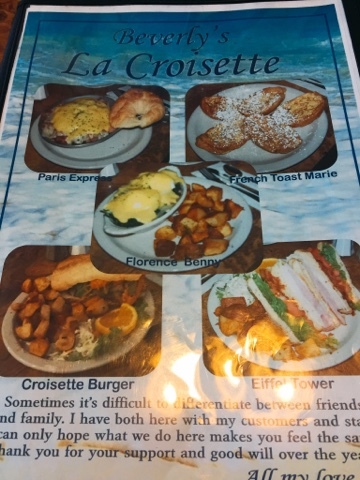 Find Beverly's La Croisette, right on Gulf Blvd. This little pink diner will be filled with townies and tourists alike, and packs its menu with inventive, decadent breakfast treats. We liked the baked omelet, topped with high-quality Swiss cheese and served with Bev's very well-seasoned home fries. 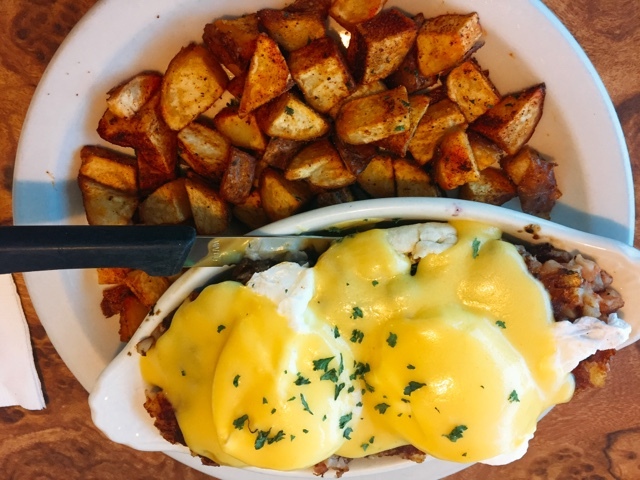 The corned beef hash Benedict was a precious plate to behold. 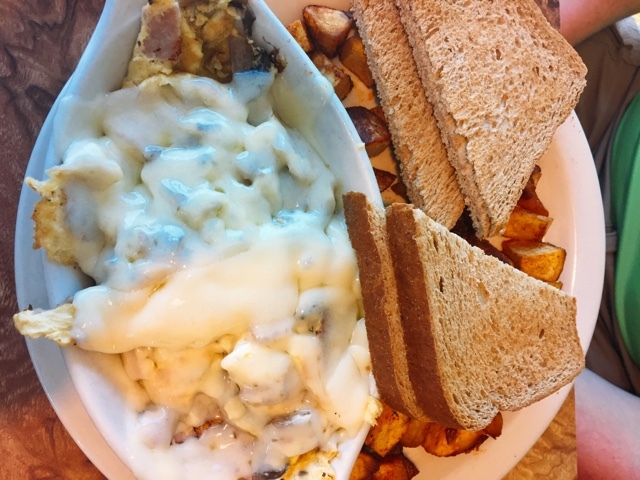 While the hash is not house-made, it is high quality and well-crisped on the griddle, to activate all its flavors and maximize the sinfulness of this dish. The creamy, rich hollandaise sauce worked with the salty hash and the perfectly poached eggs in concert. Those home fries, seasoned with garlic salt and paprika and griddled to a deep golden brown, were a terrific textural contrast. As you can see from the portion sizes, no one walks away from Beverly's table hungry. We also had a very good dinner at Snapper's Sea Grill, which is on Gulf Blvd like everything else - a spot much more tuned to tourists, but don't let that scare you away. Even though the outdoor seating is right on the busy boulevard, the atmosphere is upscale and the service is refined. Even in the February night air, we were toasty warm thanks to outdoor heaters and torches all around the deck. 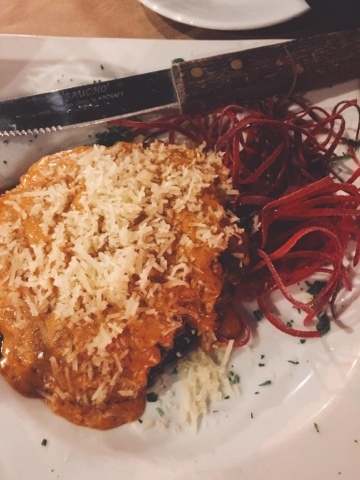 Our crab-stuffed portobello mushroom appetizer with its cheesy, ultra-rich chipotle topping was subtly spicy and smoky - delicious. 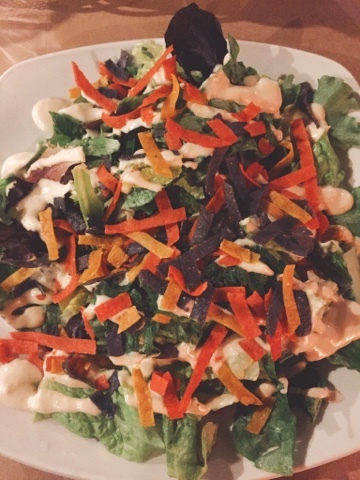 We loved the huge starter salads with their pungent and creamy garlic dressing, topped with a shower of crunchy tortilla strips. The wasabi-crusted seared tuna was absolutely delicious. Shawn ordered it cooked a bit further than I would have, but it was still flavorful and impeccably fresh-tasting. 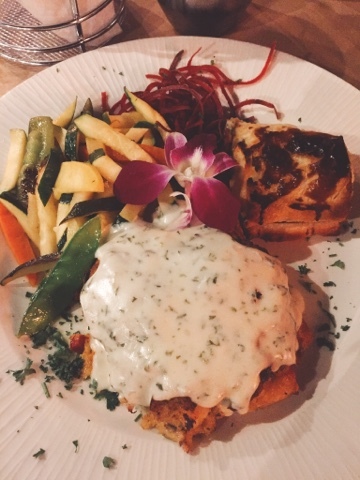 My seafood-stuffed grouper was Florida on a plate - the quintessential seafood dish. The crab and shrimp in the stuffing provided sweetness while the grouper had the fatty taste of the sea, and the champagne sauce on top mellowed and melded all the flavors together with a refined finish. The potatoes wrapped in puff pastry added richness and heft to the dish. This dinner was on the pricier end of our dining experiences on the trip - about $100 for one app, two entrees, and probably four drinks - but the more finessed approach to food at Snapper's was a welcome departure from the fish shack experience so plentiful in this area. A little more south and you hit Pass-A-Grille, a charming,Key West-esque enclave where the Gulf and the bay are parted by the thinnest strip of land clogged with beautiful old houses and tiny, mom and pop hotels. You'll hear a lot about The Hurricane here, for food and sunset views, but we found the food there very junky and the inside of the restaurant rather dirty and run-down. Early in our week, we took a tour with Eat St. Pete through the Grand Central District of the city. This neighborhood was once filled with gas stations and garages, but is transforming into an edgy strip of cool restaurants and bars. Our standouts from the tour were Casita Taqueria, which we visited again on our way to the airport, it was so good. 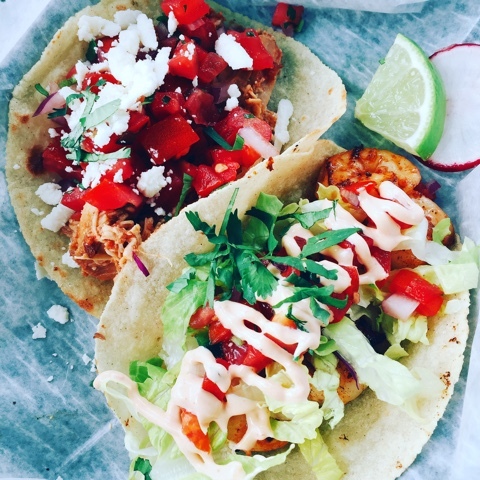 I don't think you can go wrong with any choice on this menu of small street tacos. 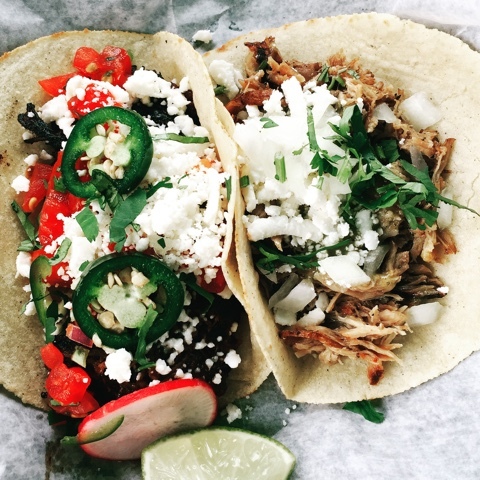 We particularly loved the carnitas and the chicken tinga. In all cases, the corn tortillas were very fresh, the proteins succulent and well-seasoned but never salty, while the toppings were balanced and bright. We had fish tacos at several other beach joints during the week that featured cheddar cheese, which is much too heavy for the delicate flavor of fish, but at Casita, the proteins and add-ones were always in harmony. 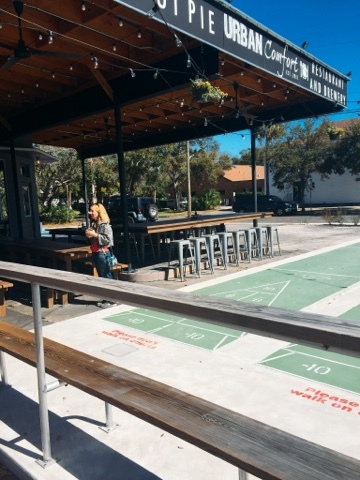 URBAN Comfort is one of a group of comfort food eateries run by the same folks, but this one has shuffleboard courts and fried chicken, so it's the one I'm recommending. 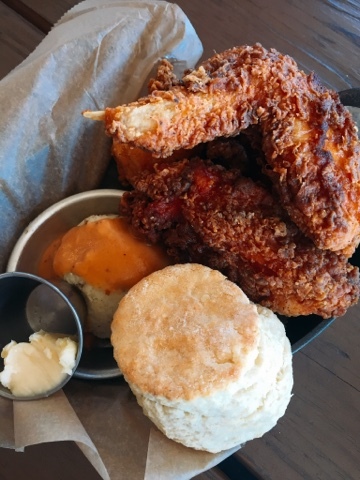 Once again, outdoor seating is the mode here; peppery fried chicken is king. The biscuits are very nearly perfect. They are brushed with butter before baking, in accordance with the prophecy, but just a hair tougher than a perfect Southern biscuit crafted with Lily White flour in the style of the old masters. The mashed potatoes we tried were buttery and earthy - a solid base for the juicy, crunchy chicken, with an orange-tinged, savory gravy on top that was buttery, as well. I would have liked to get back to URBAN Comfort for some more of their down-home eats and casual atmosphere, but we ran out of time. 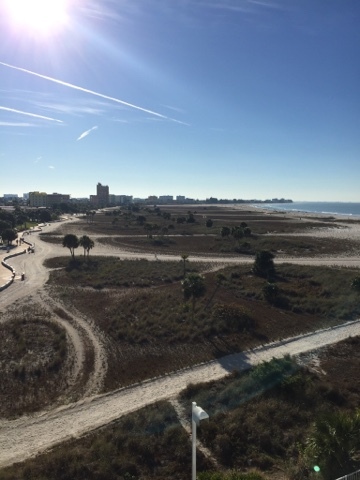 So that's my recap and round-up of the best of the beach - or at least, St. Pete Beach. We loved that each municipality had its own personality. Treasure Island had more old school, mom-and-pop hotels while SPB was more commercialized. 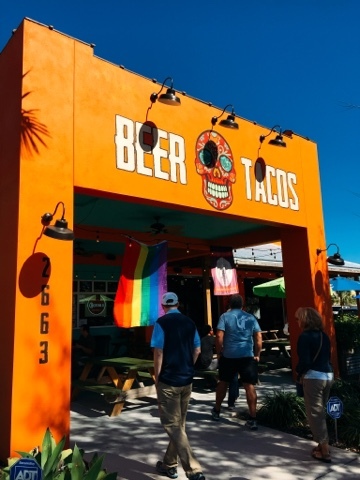 The tiny boutiques in Pass-A-Grille charmed us, while the restaurants in St. Petersburg were out to impress with progressive, inventive cuisine. 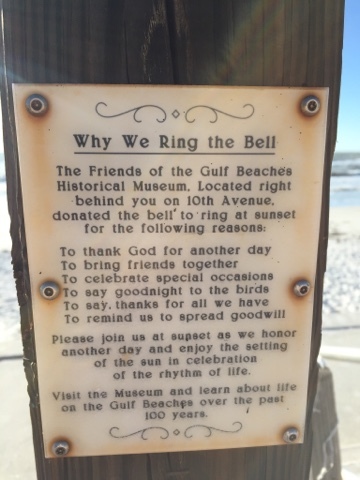 This whole area was unlike any other part of Florida I've visited - truly coastal, less spring break-y than I thought, and definitely so much more than its old nickname: God's Waiting Room. I always think to go there, but then never do. I used to be in the St. Pete area a lot for work and had some fabulous meals down there. Your vacation looked wonderful and relaxing and I love that you hit the local places. I think we would rent a house in Pass-A-Grille or stay in one of the bigger resorts in SPB if we went back. We loved the feel there!